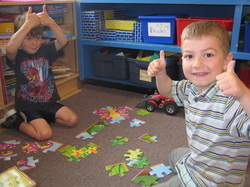 Well-integrated, healthy young children have already established a strong sense of can-do. They want to do things for themselves, and they receive great satisfaction and ego affirmation when they are able to demonstrate that they can do. We have heard young children say, “Let me try it,” “I can do it,” and “Look at me do it.” Children are asking for opportunities to test their competence. When that competence is affirmed, perceptions of self as able grow and become building blocks in the developmental process of can-do. Ego is strengthened, self-esteem blossoms, and children’s sense of personal power - that preconceived ability to make a change in your environment or in yourself - is significantly advanced (p. 4). When can do needs are thwarted, when adults ‘do for’ young children and thus seriously reduce their options and their fields of endeavour, when children’s efforts are met with impatience or ridicule, they learn that they can’t do. They learn to rely on others to do for them, and to help them in their life’s work. Adult interventions can reduce children’s opportunities to develop a sense of can-do. Some adults may be overprotective and over controlling, and such behaviours acted out upon children seriously impair their ability to develop personal power. Some adults may have the misguided idea that, unless they do everything for young children, they will be thought of as neglectful. When we can thoughtfully allow children the full range of their own attempts to do for themselves, the foundations of can-do are demonstrably established producing energetic, resourceful, inventive, capable, fully functioning adults. When we do not allow this growth to take its natural course, we get the opposite result: dependent, submissive, handicapped adults who are imprisoned by fears of failure, by their conviction that they can’t do (p. 5). 1. A playmate - two children exchange and negotiate meaning and rules for a longer period of time rather than a single child playing on their own. 2. Appropriate play materials – materials that provoke longer and richer play bouts like puzzles, building block and miniaturized versions of life activities etc.